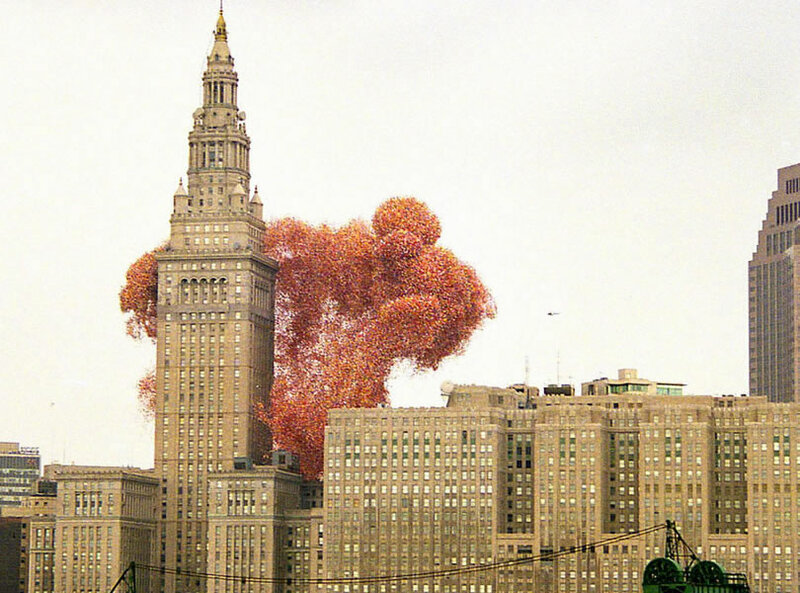 "Balloonfest in 1986 was a fundraiser for United Way and a chance to put Cleveland on the map, busting a record for simultaneous release of balloons set the previous year by Anaheim, Calif., on the 30th anniversary of Disneyland" (via). Instead, it turned into a disaster for the city of Cleveland, otherwise known as "The Mistake on the Lake." "In the hours and days and weeks that followed," John Kroll writes, "the United Way executives who had engineered the feat were reminded of the basic law of gravity: What goes up must come down." Down, in this case, on Burke Lakefront Airport, shutting down a runway there. Down on a pasture in Medina County, spooking a horse, whose owner would sue and later settle with the charity. Down on Lake Erie, blanketing the water just as a Coast Guard helicopter arrived to search for two missing boaters -- who would later be found, drowned; the wife of one of them also sued, and also settled. Down weeks later on the shores of the lake -- the northern shores, where Ontario residents found their beaches littered with thousands of deflated balloons (via). I will say, that the initial picture, of the balloons wrapping around the dull city skyline, is pretty fantastic. It's also fairly indicative of humanity: the neglect of longterm ramifications for the pursuit of instant recognition and possible redemption.